We provide a wide selection of Low Duty Digital Locks at Lockcentre to fit the requirements of basic security functions (internal protection with a low level threat of being breached). 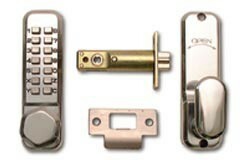 These Low Duty Digital locks are commonly used for the protection of doors, cupboards and lockers. We offer some of the top brands in Low Duty Digital Lock manufacturing including 'ASEC', 'CODELOCKS' and 'Lockey'. Safety features include multiple digit codes (2-6 digits) as well as a 3 tier system which allows a Master code, Sub master code and a user code to ensure maximum security. Digital cabinet lock for cubboards,cabinets and lockers.Quick retrofit for cam locks. Easy programming and code change.All parts, fixings and templates included.Powered by 2 x 1.5 volt AAA cells which will provide in excess of 10,000 openings. Low battery signal and facility for battery failure override. For door thickness 1 - 19mm.. External dimensions Length 136mm x Width 32mm x Depth 30mm (to top of handle). Cam fixing point 8mm square. Silver Grey finish. There are 3 program levels: (i) Master user code (ii) sub master code and (iii) user code. ASEC Model 2300 mechanical digital lock with holdback facility. Satin Chrome finish.